Whilst most of my readers will be struggling to get themselves back into physical and financial shape after Christmas and new year blow outs, China is getting ready to let its belt out, stuff the Hong Bao, and generally indulge in the biggest annual festival. After moving to the UK, my journey back for Spring Festival was a case of taking a near deserted tube to Heathrow in the early early morning, and flying for sometimes a day and a half, depending on stopovers, finding the travelling group increasingly grow with overseas Chinese, their suitcases packed with Western “delicacies”, booze and brand products to dish out back home, as a sign of their success. This in itself, becomes a scrum, but when you hit the exits in China, and are confronted with every fellow traveller, touting cab driver, street peddler and pickpocket in the city, you realise that internal travel is something of an even greater magnitude. I have always loved Guangzhou for the Spring Festival, where I can enjoy the temperate climate, ideal for going outdoors to watch lion dances, visiting the flower markets and the lantern shows. It makes for such a wonderful change from the weather of Britain. However, the one year when we had to travel across China before Chinese New Year, we did it chased by a blizzard. 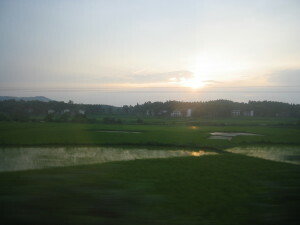 At the end of our studies in Beijing, my partner and I decided to make the journey south by train. Flights were increasingly expensive, and our student cards allowed us to get our travel at a decent price. 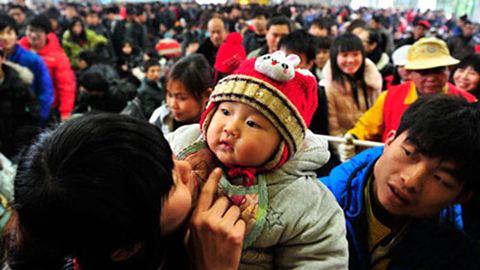 However, this now put us in the midst of 春运 (“Chun Yun”), the mass annual migration of tens of thousands, who take full advantage of the two week holidays to travel back to families they may not have seen for a whole year. The tickets become available a fortnight before travel, and are sold on a first-come-first-served basis. We’d already passed our local ticket office and seen queues around the corner, so decided to get up as early as possible. My partner woke up far earlier than he had meant to, but eager to get the job done, he slipped on his heavy winter gear over his pyjamas (Beijing winters hit double figure sub-zero temperatures), and at four o’clock, took the short walk from our flat to the local ticket office, only to be confronted with a queue of about 20 people outside the building. I only found out about this after I woke an hour later, and saw a text from him. I filled bottles of tea, and joined him for the remaining four hours, taking it in turns to go get more tea, or eat, or just thaw out, but eventually, we did get tickets, on our third choice of train. Sending some of our possessions on by courier, we embarked on our journey. The crowds of the spring migration of China had certainly begun to build up. Our taxi to Beijing Train Station took double its time due to the packed roads. And then pushing through the jostling crowds, we were being herded to our respective trains. The facilities at the station, usually pristine, were showing signs of over-use, and the crowd would have been fractious, if it weren’t for the overwhelming excitement and anticipation of so many expectant minds, all thinking of home and family, and what a feast they’d be welcomed with. Our local friends had piled us with convenience food and snacks to consume on the train. I found myself approached by an old woman with her child in the waiting room, and happily gave her a few of bowls of instant noodles, hoping that the rest of our store would see us through. Turning up to Spring Festival with a good appetite is never a bad idea. 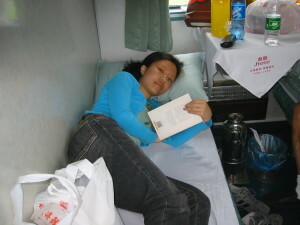 The interiors of the train were sparse and quite narrow, with most things in white. Our suitcases could just about be wheeled through the coridoor, past the rows of cabins. As we had intended to see what travel is typically like, we didn’t book a single compartment to ourselves, but opted for the communal bunks. We could have gone further, and gone for seats, but the barely padded pews of the seated carriages, and the associated aches, numbness, general irksomeness and insomnia would have been hard to bear for a twenty-two hour stint on an occasionally bumpy ride. Some of my university friends told me the trick was to buddy up, and get one seat and one bunk, taking it in turns to get some proper rest. The only problem being if your friend, having gotten the comfy bed, decided they were going to stay there, there wasn’t much you could do. So they’d worked out a deal, that whoever was in the seat, held on to the return tickets. Further down the train, in the space between the seated carriages, the luggage and goods coaches, were the cheapest of passenger faring. The standing spaces, with a collection of leather hand straps and posts to stop the passengers from careening into each other, where clever passengers snuck in folding stools, and even more clever passengers hired theirs out when they felt like standing and stretching their legs. Travelling by train took about four times the length a flight would have, but provided you have a bed, a book, and no need to hurry, the experience was unforgettable. Yes, you could lie down to sleep at night, but you could also sit up, or get up to walk about, and whilst the day bought views of the rolling and changing Chinese countryside, from red earth to rice fields to distant towns. The night, brought something I’d seldom seen in England, and near forgotten it had existed in Beijing. The night sky awash with stars. Small communal tables under most windows give you somewhere to eat a meal, or have simply have relatively private moment, and as I wrote, I could not tell if having those inspiring sights before me as I raised my head helped or hindered my work. We had travelled for half a day, slept through the night and wiled away the morning, and we looking forward to reaching our destination, a hot shower and some solid ground. With only a short while to go, a group of women proceeded into our compartment. Led by an older woman, the girls were very neat, dressed in some sort of uniform, and very smiley. The older woman asked if they could sing for me. It was hard to refuse. The group burst into song, at full volume, in perfect harmony and seemingly without effort. The melody reminded me of music I’d heard as a child seeing Mongolian troupes on stage with my family. 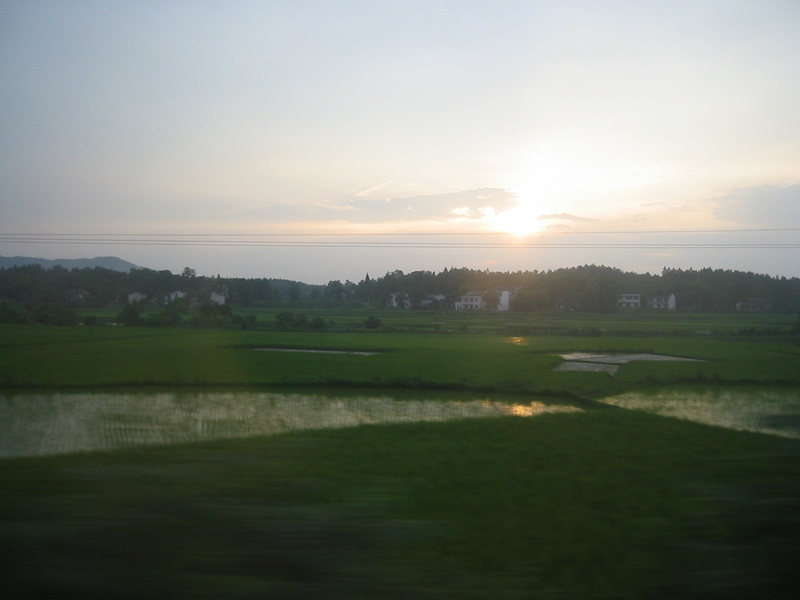 I gazed out of window at the rice paddy fields and considered the variety of our culture. Their song finished and I profusely praised their singing. The troupe leader informed me they were from a beauty salon, and they were singing to as many people on the train as they could, practicing for a new year show they were traveling to. I nodded and smiled embarrassedly, I was thoroughly glad my English partner had gone to stretch his legs, or else they would have probably stuck around and sung more, probably following him off the train, like a flock of particularly harmonious ducklings. That was back in 2009, when work had just begun on the Jing Guang (Beijing to Guangzhou) high-speed railway, which opened in 2012. Now it takes only about nine hours to travel these 2200 miles. Considering that during my parents’ time, many had to stand for days on end, on long, slow, domestic journeys, now they can at least have a seat and enjoy the much shorter train ride, this is a huge improvement. I hope that still leaves time for impromptu card games, traveling choirs, and a little time to reflect on what exactly it is we’re coming home to.